With large, pretty windows to the front and sides of the building providing wonderful views out to the garden, the 9’ x 7’ Rowlinson Chatsworth Summer House gives a great first impression. 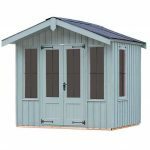 Although this model is supplied in a natural timber finish, you may paint the summer house to make a delightful feature within your garden. 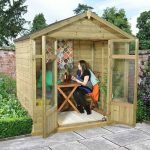 This great-looking summerhouse has a more Victorian feel, and will add to the grandeur of your garden. Bi-fold doors are lockable, and add both style and security to the construction. The structure also benefits from 12 mm shiplap cladding and tongue and groove flooring, so it is impressively sturdy and resistant to rot. There is a 10-year anti-rot guarantee to back this up. Heavy-duty mineral felt covers the roof, adding even more protection against the elements. With toughened glass too, this 9’ x 7’ summerhouse has a lot to offer. The bi-folding double doors can be opened fully to expose the summer house to the sights and sounds of the garden. The summer house may be enjoyed all year round, with uninterrupted views through the large windows on three sides of the building. Finding the right summer house for you and your garden is really all down to personal preference; which features are important to you and which aren’t. 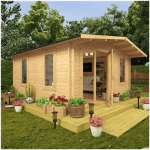 The need for a summer house to be aesthetically pleasing is also important as, unlike a shed or similar building, it will no doubt become a major feature within your garden. In this section we take a look at all that the Chatsworth has to offer. Exterior: The summer house is constructed from 12mm shiplap tongue and groove cladding, giving the building a practical, durable yet aesthetically pleasing exterior. The building will be supplied in a natural timber yet, as you can see from the picture, this has the potential to be painted the colours of your choice to create a summer house that is unique to your garden. Interior: The summer house has a 9’ x 7’ interior space, which is essentially a blank canvas upon assembly. Here you are free to create the garden room of your dreams, whether that is an outdoor dining area, a relaxation space or a hobby room. Whatever you decide to do with the space, you are sure to be able to enjoy fantastic views all year round. Windows: The windows have multiple panes and allow a 180 degree view, on three sides of the summer house, from sitting within. The windows are a charming design and in-keeping with the classic style of the summer house. Doors: The Chatsworth has modern style bi-folding doors that allow you to open the summer house up completely to the garden. Bi-folding doors fold and slide which creates a fantastic outside-in feeling and is a wonderful feature that can be enjoyed in the warmer months. They also allow the easiest access for taking in and out large pieces of furniture or equipment. Security: The bi-folding doors are lockable, giving you peace of mind and ensuring that items inside are kept secure whilst the summer house is not in use. 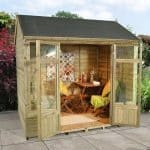 9’ x 7’ Rowlinson Chatsworth Summer House: How easy to build? The Chatsworth is a fantastic summer house, which you will no doubt be eagerly waiting to build as soon as it arrives. There are two options available – the first being self-assembly and the second is taking advantage of the professional home installation at an additional cost. If you do decide to assemble the summer house yourself, we expect it could be assembled within a day by two people with a basic knowledge of DIY. Everything you will need for assembly will be included in the package; timber panels, glazing, roofing, fixtures and fittings. 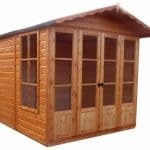 9’ x 7’ Rowlinson Chatsworth Summer House: What is the overall quality like? 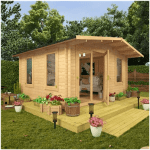 The Rowlinson Chatsworth is not only a summer house that is pleasing to the eye, it is also a high quality and practical building that can fit into your garden lifestyle and offer a multitude of uses. The bi-folding doors are a major feature, folding and sliding to reveal the opportunity to enjoy the sights and sounds of the garden from the comfort of the summer house. Both the windows and doors use a multi-pane design and are glazed with 2.5mm styrene. The summer house is constructed from 12mm shiplap cladding and tongue and groove flooring, whilst the roof provides a protective layer against the elements with heavy duty mineral felt. It is highly recommended that the building be assembled and placed upon a flat surface to give it the stability that it requires. If no such surface is available within your garden, a choice of bases may be purchased as an additional extra during the purchase process. 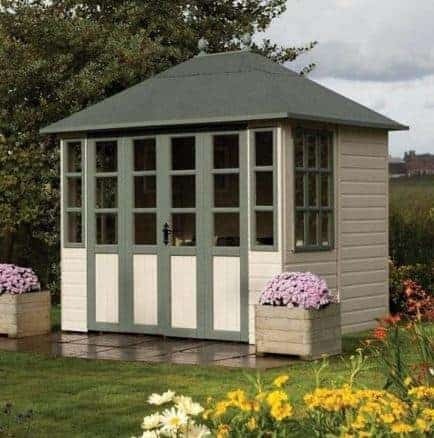 The 9’ x 7’ Rowlinson Chatsworth Summer House is a fine example of a summer house that would look equally at home in a contemporary styled garden as it would in a quintessentially English country garden. Everything about this wonderful garden building is aesthetically pleasing, from the pretty windows to the timber cladding. This is a summer house from which you can enjoy views out to your garden all year round and whatever the weather. We are thinking if purchasing this summerhouse but would like to see it on display. Do you know if anywhere please ? I don’t know of any showrooms that have this particular one. The Taylor Garden Buildings showroom in Northampton is pretty good if its not that far. The interior wood is of rough sawn timber ,not face edged as expected. The roofing felt is not heavy duty , as you state ,but the thinnest you can get. My work shed is of better quality. Had to wait 5 weeks for delivery,so overall not best pleased.